This is #20 of 108 Ways to Livin the Moment. Let’s take back our lives one beautiful, funny and delicious moment at a time. Graveyards have a spooky, scary stigma. But according to yogi Satchidananda, a graveyard is really a junkyard…a silly waste of space. Many years ago I celebrated Halloween in Oaxaca, Mexico. They call it something different there…Dia de Los Muertos and it takes place every year on November 1 and 2. 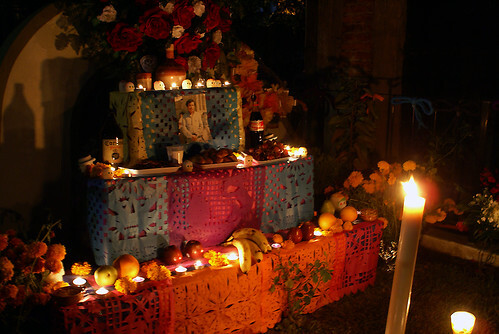 Dia de los Muertos is considered a window where the spirits return to earth and head to the graveyards. The gravestones become gorgeous altars (see above photo), and all fears and sadness surrounding death evaporate in this guitar-playing, tequila-drinking, 2 day extravaganza. 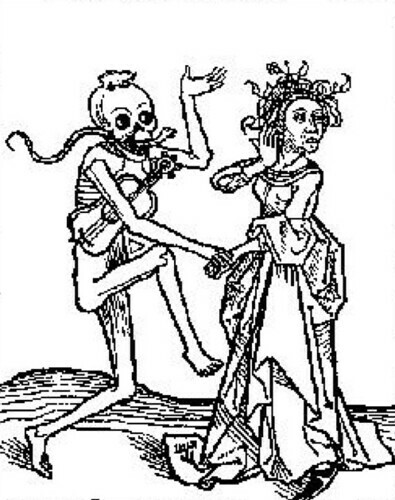 The most common site during this holiday are skeletons…but not scary skeletons…rather skeletons dancing, playing, partying. It gives death a whole new life. Prior to this experience in Mexico, I had the worst fear of death and especially of cemeteries. But now, I see death as a mystery, maybe it is the end, but maybe it is a new beginning. Even if it’s just one, single moment in your day, that’s where the celebration begins. My new book contains 108 suggestions for creating moments of joy, passion, laughter, deliciousness, and naughty delights. It inspires you to become what I call a Momenteer. To find out how you can become a Momenteer, email yeahdave@mac.com and write Momenteer! in the subject. And to those of you who have already signed on, this week you will be receiving something very inspiring. Stay tuned!